For so long the number 11 has had some strange significance in my life. It’s one of those numbers that I just see all day long and it reminds me that God is with me, loving and protecting me. Today, on November 11th, that number got even more significant in a personal way. My grandmother of 95 years is resting in the arms of her Lord. 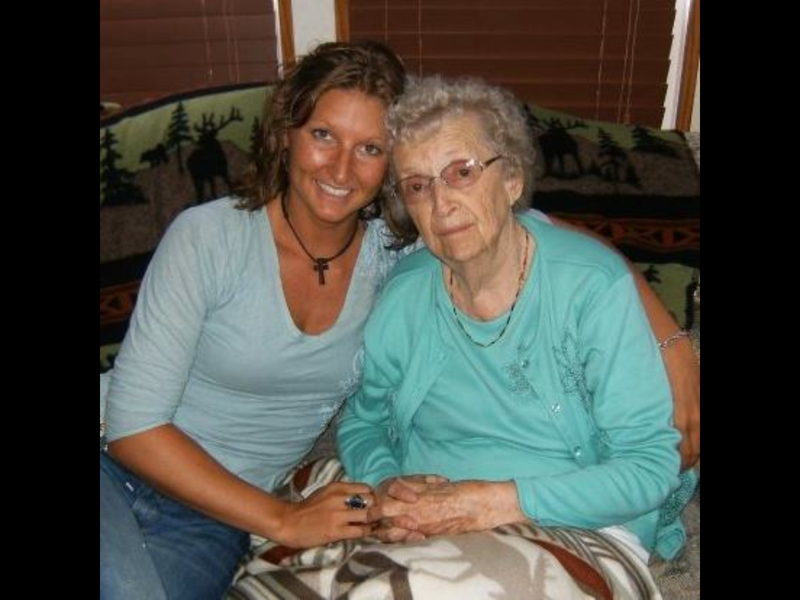 I want to dedicate this blog to honor a woman of great faith, integrity, love and generosity. My grandmother has followed the Lord most of her life. From the time I was a small child until this day I have watched her love, serve, honor, sing, pray and give all of herself to bringing Him glory. My grandma prayed for me through all my years of sin and running from God. She NEVER gave up. She reached out to family, friends, neighbors and anyone in the church who needed an ear to talk to, a shoulder to cry on, a warm meal or a smile that could change the atmosphere of a village. She was someone who truly loved unconditionally and prayed for people without ceasing. The miracle of the Lord’s work in my life is truly a fruit of her prayer. I was so blessed this past summer to spend time with her. Making her soups, praying with her, reading to her or just sitting with her while she slept. Though many times she was too weak to leave her apartment she never failed to stop writing letters to people in prison, love on everyone who walked through the door to visit her and get on her old school corded phone to encourage people all day. She never seemed to complain in all her pain and suffering. She lived a life for others…it wasn’t about her. My grandmother was such an example of what I hope to live up to, to be more and more like Jesus every day. In the face of death she saw life and fearlessly walked that journey serving others in such love and compassion. It was always about others. I believe as she goes to be with the Lord that she is passing the mantle of prayer on. I would like to ask you to pray, in honor of my grandmother, this scripture over all your family today. I pray that this year the fruit of her prayers would be seen in all the family, friends and neighbors she prayed for. I also pray this for anyone reading this, that the Lord would be faithful to answer every prayer that you are faithful in praying. My life is the fruit of her prayers and I know there is much more to come. It is hard for me not to be with my family during this time so I would also ask you to pray for them as they are celebrating her life. Thank you for sharing this bitter sweet post. Your grandmother sounds wonderful. Thanks for sharing the scripture verse. I have never noticed that passage before. Love and prayers for you and your family Jill. What a beautiful legacy and you’ve done a lovely job in honoring her! Continue on in truth, love and mercy! Thanks Bette! She sure was amazing and her fruit will never die. Darling Jill, I know what it is to be far away from family and to lose a loved one while being away from family. i find my great joy like you in the holy walk of the loved ones and in the years of having walked close to them, as the Lord allowed. My heart goes out to you at this time and to each of your loved ones. I am asking Jesus to tell your Grandma that I love her and that I love you. Pat E.
Thanks so much Pat, love you bunches!